NOTE: the March meeting is being held on the 2nd Saturday of the month due to St. Patrick’s Day. We are really pleased that Anne O’Rafferty has agreed to be our speaker for the meeting. We will also have a Charity Swop Shop in aid of our new 2019 charity Lakers – so bring along all those unloved fabrics and other sewing items! There will also be a Sit & Sew Afternoon – use the opportunity to finish those UFO’s! If you are attending, don’t forget to bring your lunch. AGM – our AGM will be held immediately prior to the monthly meeting at 10.30 a.m. Following the AGM, we are delighted that Moya Geraghty of Patchwork Plus will be returning to WPG for our February meeting. Moya has very kindly agreed to be our Speaker for the meeting. She will also be bringing her Shop and will be doing a day and a half workshop. 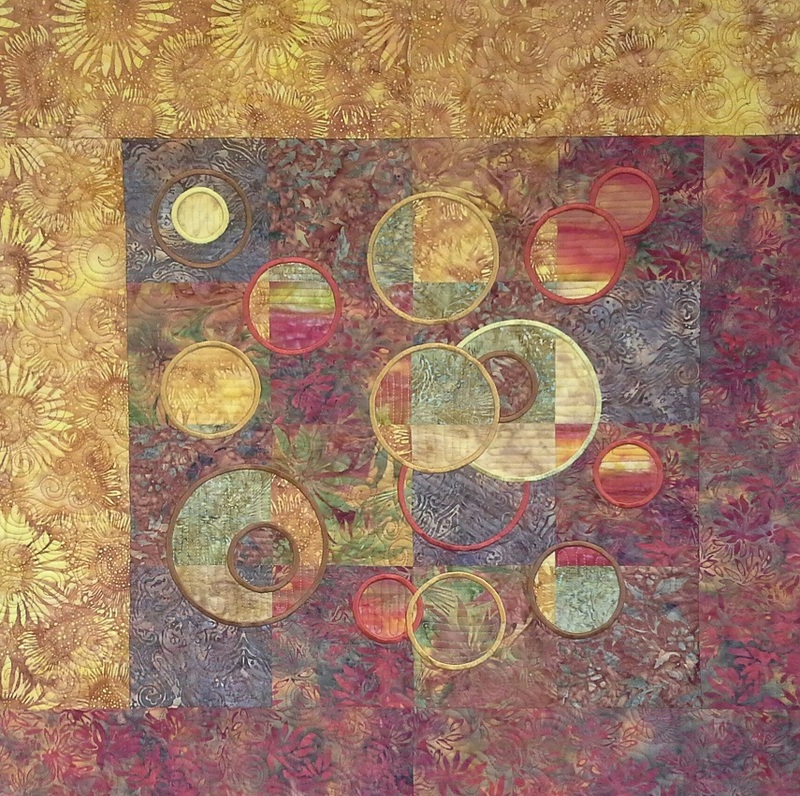 The theme of the workshop is “Circles in a Square”. Bookings can be made by contacting our Workshop Organiser, Moira Byrne at workshops@wicklowpatchwork.ie Limited places still available. 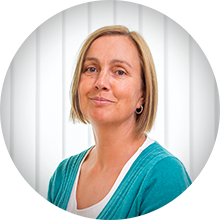 Speaker – We are delighted that Lois Davies will be the speaker for the meeting. Shop – Knitting Dock Bray (between 5% and 10% discounts available). 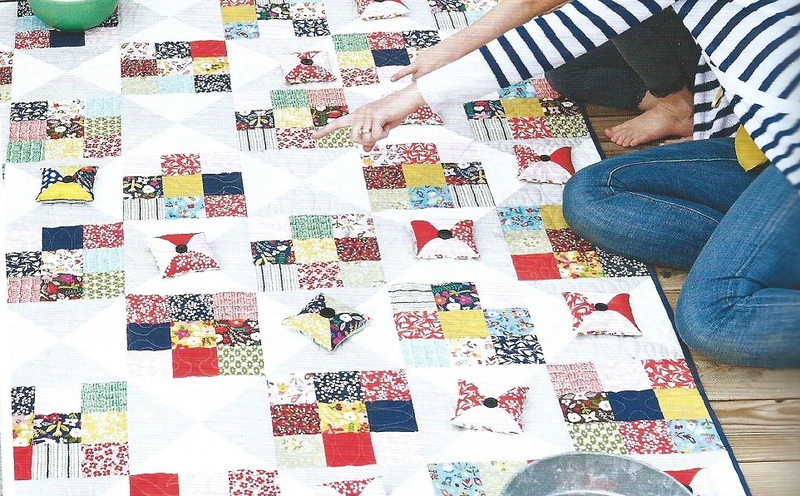 Sit and Sew Afternoon – bring along all those unfinished projects and get sewing! December meeting/Christmas Party. We hope you can join us for tea/coffee, mince pies and lots of fun! We will have Kris Kindle on the day – please bring a small gift (max value €5). It can be sewing related or not, but preferably something that you have made yourself. There will be lots of Christmas demonstrations on the day and also a Christmas Challenge for a Christmas themed project, however big or small, that you have made – there will be three prizes for the best projects voted for by the members! There will also be a Charity Swop Shop in aid of our 2018 charity – Wicklow Hospice Foundation. The Speaker for the meeting is our member, Lois Davies. The Shop will be provided by Terri McNeill. Workshop – 17th/18th November (Saturday afternoon and all day Sunday): Alternative Stained Glass (no bias tape). Two types of Kits are available for the workshop: colour kits only or full fabric kits (no backing or batting). Fusible web and freezer paper are also available. Please make a decision on which kit when booking your place on the Workshop. Last booking for kits will be taken at the monthly meeting on 20th October. The speaker for the meeting will be member, Patricia Timmins, award winning smocking expert, who will speak to us about all things smocking. Shop – we look forward to welcoming Wendy Huggins of Fabrics Matters who will be bringing her shop to the meeting. There will be no workshop in October. The Raffle for the sewing boxes and scissor set donated by John O’Donnell in aid of our charity, Wicklow Hospice Foundation, will be held during the meeting – there are three prizes. Membership Renewal Day (September 2018 – August 2019) – the membership for the coming year is €20. 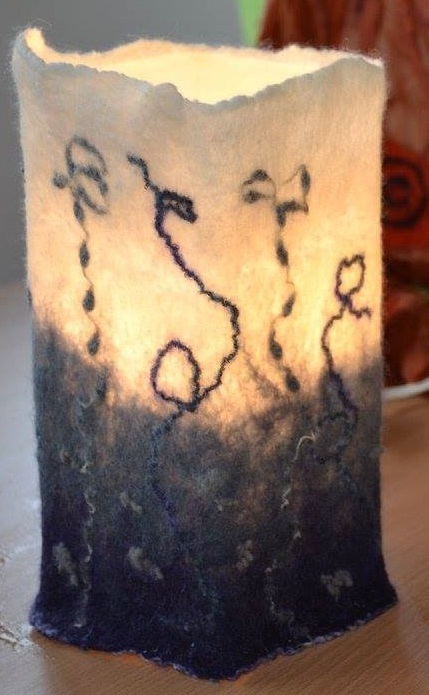 Evelyn Shannon will be the speaker at our September meeting and will talk to us about her work with wool. Evelyn was due to speak at our July meeting but unfortunately was unable to attend. We are also delighted to welcome Eilish Murphy of Sew Dublin who will be bringing her shop to the meeting. The Exhibition will be officially opened on Thursday, 12th July 2018 from 7.00 – 9.00 p.m. by Freelance Journalist and Writer, Valerie Cox. Evelyn Shannon will be the speaker at our July meeting and will talk to us about her work with wool. She will also collect quilts for any members who wish to enter quilts into the Tinahely Show on August Bank Holiday Monday. A four day Dyeing Workshop is being provided by Moira Byrne and Lorna Lafferty in the Community Hall in Newtownmountkennedy. For full details about the workshop click here. The Speaker for the meeting is Cliodhna Quinlan – textile and dry point etching. With her sister, Grainne, she is exhibiting her work in the Signal Arts Centre from 28th May to 10th June 2018. There will be a Charity Swop Shop at the meeting in aid of the The Wicklow Hospice Foundation. There will also be a Sit & Sew Afternoon to give members an opportunity to work on their projects for our upcoming Exhibition in the Signal Arts Centre from 9th/22nd July 2018. The exhibition of the work by WPG members is currently being held in the Signal Arts Centre Bray from 9th to 22nd July 2018. 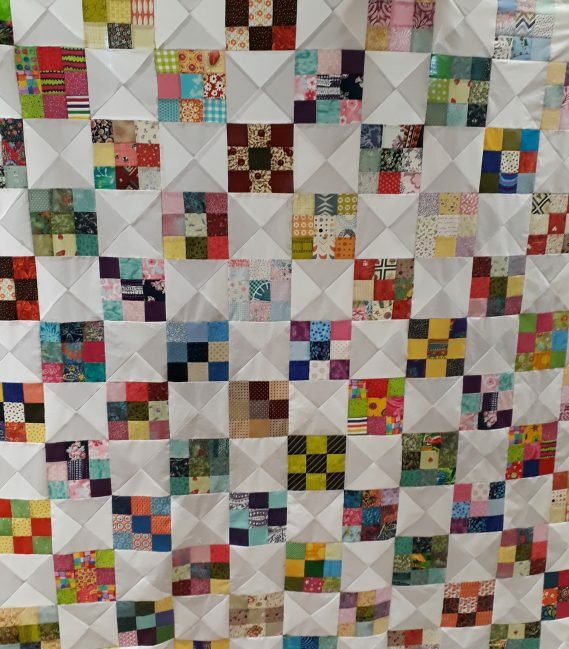 The centrepiece at the Exhibition will be our Collaborative Quilt which will be raffled for our 2018 Charity, The Wicklow Hospice Foundation. 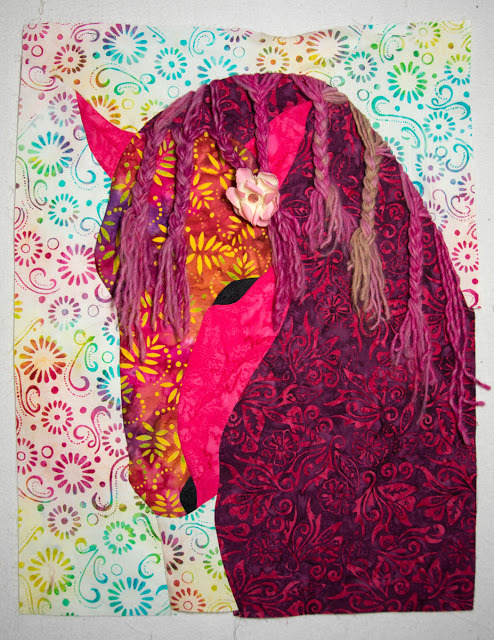 The Speaker for the meeting is Sidella O’Brien who will talk about painting, printing and embellishing fabric. The shop will be provided by our neighbours, Appletree Crafts. 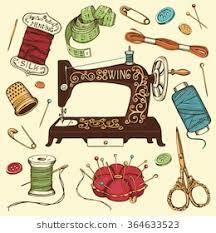 John O’Donnell will be at the meeting to service/repair sewing machines. Unfortunately we are fully booked and have no more spaces for machines. There will be a Sit & Sew Afternoon after the monthly meeting. If you are staying, don’t forget to bring your lunch! 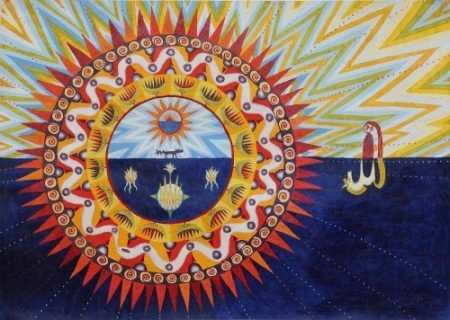 Sunday, 20th May – A full day workshop will be provided by Olena Pujachova. 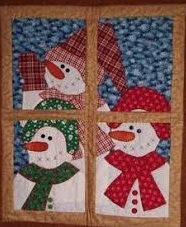 The topic for the workshop will be Applique with Curved Piecing. A big thank you to everyone who joined us for the Sewing Day to put together our collaborative quilt on Saturday, 14th April 2018. Thanks also to everyone who made blocks for the quilt. 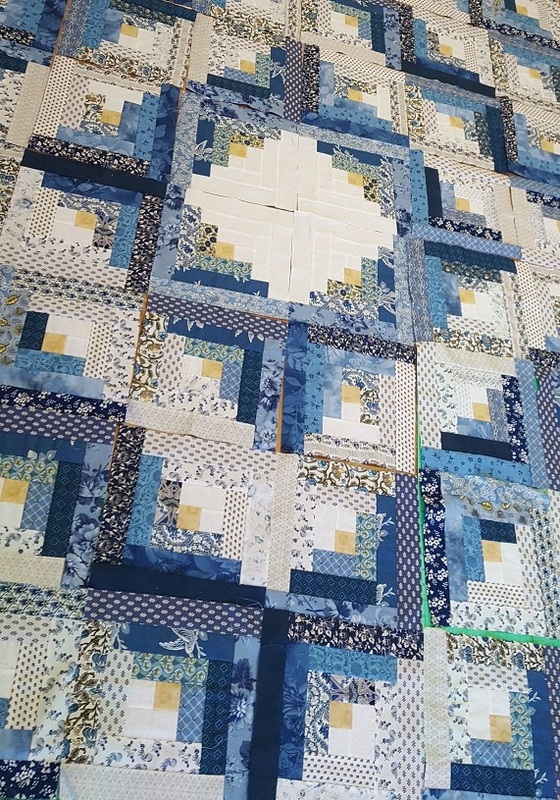 As you can see the top is almost completed – the border needs to be attached and it will be ready for quilting. It will be on display at our monthly meeting in April. 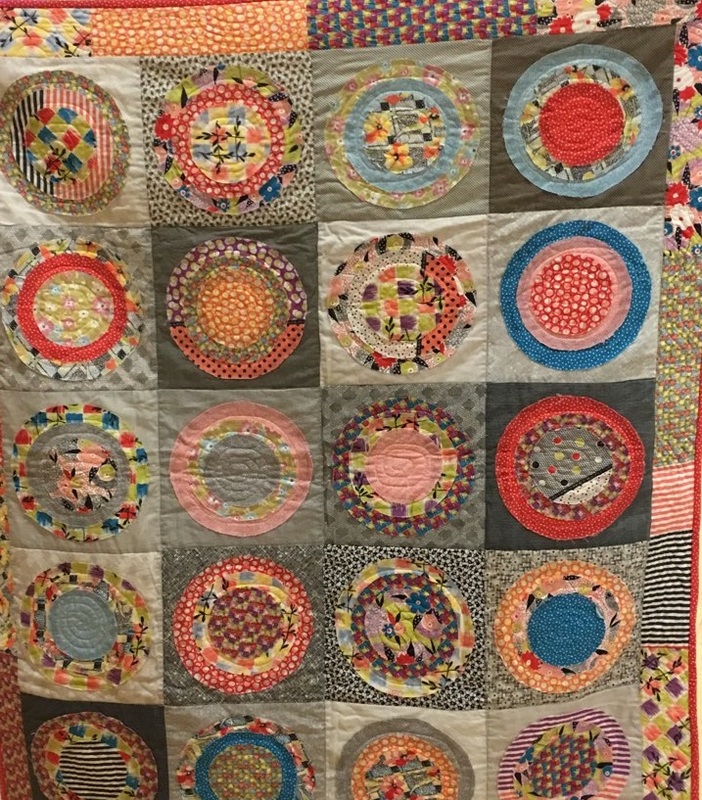 The quilt will be the centre piece of our Exhibition in the Signal Arts Centre in July and will be raffled for our 2018 Charity – The Wicklow Hospice Foundation. 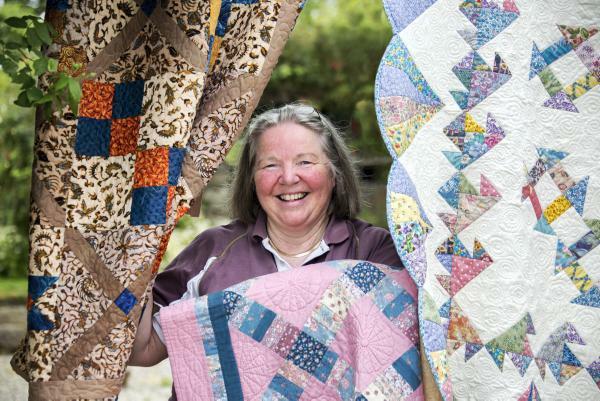 Gaye will be doing a day and a half workshop based on Log Cabin with particular emphasis on her cutting method and also a Pickwick Quilt. Anyone interested in doing the workshop should contact workshops@wicklowpatchwork.ie The cost for the day and a half is €40.00. For anyone who has made drawstring bags, or has other supplies for students in Uganda, Helen Dodd will collect them from you at the meeting. The Honorary Consul for Uganda, Sylvia Gavigan, is assisting in setting up a school in her village in Uganda. 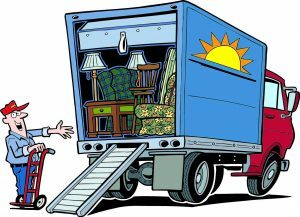 A container is leaving Ireland after Easter and will be filled with all sorts of items, including bicycles as transport for the children. There is a callout for sewing supplies. All sewing related items will be welcomed. WPG members are asked to assist by making some draw string sewing bags for the students. A fat quarter will make a good sized bag. It is suggested that the bag be lined to make it more robust. Basic sewing supplies, including fabric, would be great in the bag. Sewing machines would also be welcomed. Helen Dodd will be in the Community Hall in Newtownmountkennedy on Saturday 24th of March for a workshop and will collect the items then. St. Patrick’s Day Challenge – like the very successful Christmas Challenge, we are doing a St. Patrick’s Day Challenge. So bring Paddy’s Day items that you have made (however big or small) and a winner will be voted by those present at the meeting! A professional scissor/knife sharpener will be attending the meeting. The sharpening of knives will cost between €2 and €3. Scissors will cost between €4 and €6 depending on size. Please ensure that your scissors/knives are very clearly marked. The AGM will be held immediately prior to the monthly meeting. Our speaker for the regular monthly meeting is Sinead Byrne of Appletree Crafts. There will be a Charity Swop Shop in aid of our new Charity at the meeting -The Wicklow Hospice. We are doing a charity collaborative quilt again this year. Anyone interested in participating are asked to bring scrappy nine patch blocks using 2.5 inch squares to the February meeting. Completed block size 6.5 inches. No white or light grey in your blocks please as these colours will be used in the alternate blocks for the quilt. A date for putting the quilt together will be advised shortly! December meeting/Christmas Party. We hope you can join us for tea/coffee, mince pies and some fun! 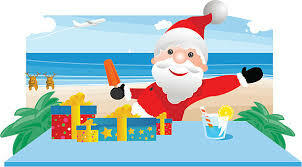 We will have Kris Kindle on the day – please bring a small gift (max value €5). It can be sewing related or not, or perhaps something that you have made. There will be lots of Christmas demonstrations on the day and also a Christmas Challenge for a Christmas themed project, however big or small, that you have made – there will be a prize for the best project voted for by the members! Stay behind after the meeting for the afternoon and help us make covers for our new book stands. Fabric will be provided for this collaborative effort! On Sunday, 19th November a full day workshop will be conducted by our girl from Wicklow. Helen Dodd’s workshop will be based on the Clamshell design. 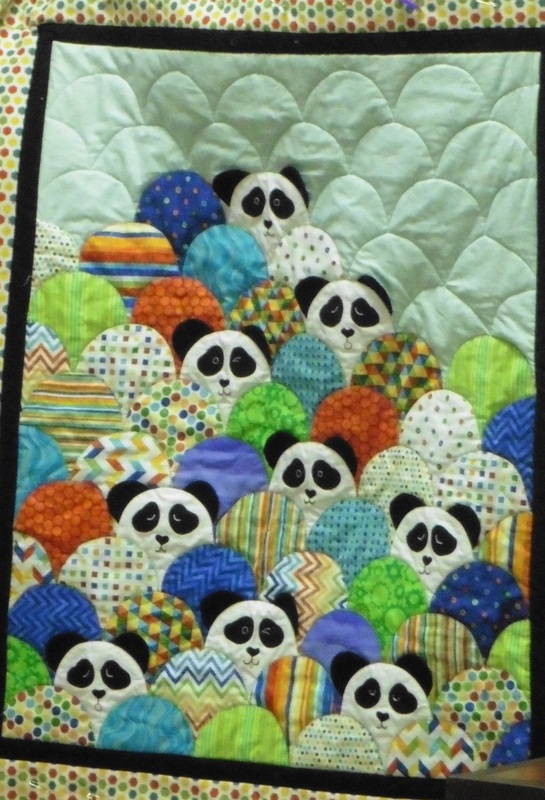 She will show us how to make this design with a slight difference and will send us home with a panda cushion, or maybe you would like to do a different animal. Could be a Christmas or baby gift! The workshop will run from 10:00 a.m.to 4.45 p.m.
A Dyeing Workshop will be provided by Moira Byrne and Lorna Lafferty in Newtownmountkennedy Community Hall on Saturday, 26th August 2017 from 10:00 a.m. to 4:45 p.m.
the dyed fabric from the previous day. The cost of attending both days is €40.00. If you are interested in attending these workshops please contact Geraldine – workshops@wicklowpatchwork.ie or sign on with at the next meeting. 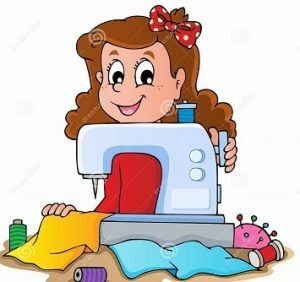 Sewing day in the Community Hall in Newtownmountkennedy from 10:00 a.m. to 4:45 p.m.
Bring any project you are working on, stretch a quilt, enjoy a chat, etc. As well as bringing your sewing equipment, extension leads, etc., don’t forget to bring your lunch as well! Tea/coffee/biscuits will be provided on the day. 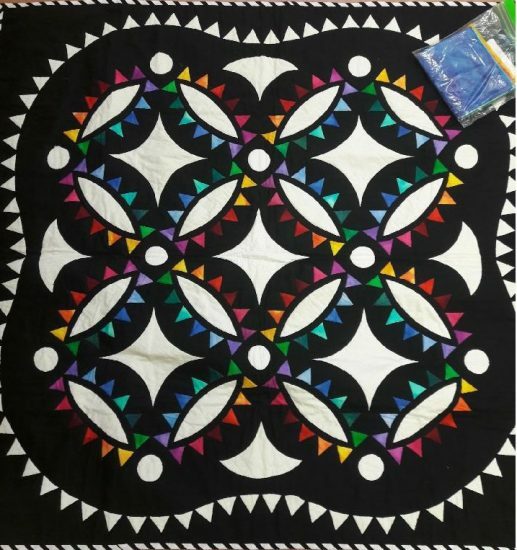 The technique is reverse applique called “Circling the Square” which involves reverse applique with circles, satin stitch or other fancy stitches with machine and either straight line or free motion quilting. Emer will also be providing a Workshop on “Colour for Quilters” on Saturday afternoon 21st October and all day Sunday 22nd October, 2017 using colour in quilts, the colour wheel, and value. Mini-workshop – Exercises in colour wheel, value, scale and proportion. Design a cushion, based on the exercises and your fabric collection. All-day workshop – Further exercises in the power of colour and value. Design and make a small quilt, using these exercises as an inspiration.